We’re going to see the Galaxy S3 introduced quite a while before the next iPhone, but that hasn’t slowed down the iPhone rumors any. Hot on the wish-list are a quad-core A6 CPU, LTE, and perhaps most intriguingly a 4” screen. A 4” screen might seem like a no-brainer, but it presents problems of its own. Apple has long said that they like the form factor of the iPhone, and they have steadfastly refused to increase the size of the iPhone even as American’s shifted in preference to 4.3” devices. Another reason Apple has resisted increasing screen size is that it would create imaging problems – do they keep the same resolution and just add pixels (forcing developers to revamp all of their apps) or would they simply reduce the pixel density to make it easier on developers (at the expense of image quality)? A new mockup shows that this may not have to be an either-or proposition. A programmer named Will Hains has mocked up an idea that would allow the next iPhone to retain the same size despite its 4” screen, while also solving the dual problems of resolution and app compatibility. The solution would be for Apple to change the aspect ratio of the screen, adopting a taller screen while preserving the same width. The resulting screen would be 1152 x 640 pixels, and could actually fit within the current iPhone size, although the home button would have to either shrink or change size. The result would be one more row of icons on the home screen, although it would open up quite a lot more room for watching movies or playing games. The aspect ratio wouldn't quite match up with the 16:9 format that many movies and most HD TV programs adopt, but it would be very close - much closer than the current iPhone screen. It would also allow the UIs of most apps to stay the same in terms of pixel density; perhaps by default and app could float above the four bottom buttons with no change at all until a developer made the minor changes to allow for a longer full-screen app experience. Is this what Apple will do? Time will tell, but we have to admit that this feels like a very “Appley” solution to the problem. We have no idea whether or not the mockup’s styling has any bearing on the final product – and really that isn’t important here; the key is that all the rumors pointing to a 4” screen on the next iPhone may not require a radical overhaul of existing apps, nor a change in size of the phone itself. What do you guys think – do you hope Apple adopts this screen solution in their next device? Screen size is definitely a big factor for me. 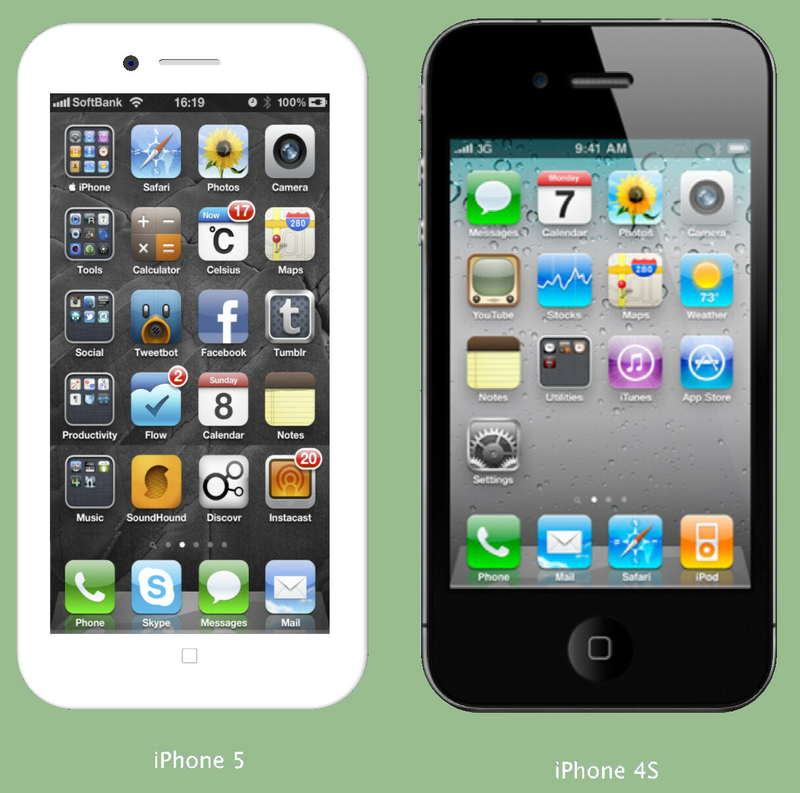 I hate to leave Apple, but it's possible I might shop around if the next iPhone doesn't have a larger screen. There are no high end devices that still come out with 3.5" screens. Also, Apple hasn't made a change to their 3.5" since 2007 when the first iPhone debuted. That's 5 years of having the same screen, and it's getting old. Out with the old, in with the new, Apple!!! While I agree its a bit outdated and I would like a bigger screen as well the fact they are the only ones with a high end 3.5 inch phone means that everyone who prefers a smaller screen but wants a high end phone the iPhone is the only choice. thats just not true, how about HTC Radar w 3.8" screen? A lot people, especially the android camp, are caught up in screen size as measured diagonally as OPPOSED TO the total surface area. A 4" display with a 16:9 aspect ratio has LESS surface area than the same 4" display with 4:3 or even 3:2 aspect ratio, respective. I never liked HTC devices because the had 4" display but where very narrow like a thin rectangular. Instead I prefer something like the Pantech Pocket whose 4" display has 20% more surface area than a typical 4" narrow display. If you like I can create a 4" display THAT HAS LESS surface area than Apple's 3.5" display. Again, go back to either your geometry or trigometry class -- it's easier to prove this with the law of cosines. I don't think it would have lesa surface area...the area would be the same if you measured. The lenthwould get bigger on a 16:9 display...but it will get thinner. The reverse for a 4:3. The surface area would not change at all like you said. wrong. I computed it. a 4" phone with a 4:3 ratio would have a surface area of 7.68 inch^2 while a 4" phone with 16:9 ratio would have an area of 6.835 inch^2 the guy is right. you should go back to your geometry classes. iPhones are very popular in schools. Most children that are under 16 have phones nowadays. The most popular phone among the children is the iPhone. It's simple, and it fits the in hand prefectly for the kids. After the kids use it, (believe it or not) the parents and relatives get one just to be cool. True fact. I just wanted to point this out. Also, young ones are attracted to the iPhone (iOS) because of the variety of games. Don't get me wrong here, Android has games, but in *overall quality* of games, iOS has a definate advantage. yes,this is true.Nearly all my classmates want or have iphones.I think that i am among the few classmates who wants a galaxy s3. 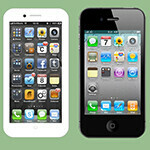 The screen size stayed at 3.5" but the introduction of the retina display set a new industry standard. People need to understand that the iPhone is a phone first and smartphone second. Battery life is important for a phone since large displays works against battery life. Then there is the issue of 4G that uses up battery life quickly. What Apple has done is to work on the battery life until it can support a larger display or better yet, a larger display and 4G. If you look at what Apple has done with the battery technology for its iPad series, then expect great things for the iPhone 5. I don't have an iPhone and the smallest screen I will accept is 3.7" and would prefer 3.8". The 4" screen in this article is not aestethically pleasing and is too narrow for my taste. I think Apple should stick with their 3:2 aspect ratio and go to a 4" diagonal. That would be perfect. Pixels would be 720 x 1080 and the actual screen dimensions would only change a little, so they could keep the phone fairly small. Width would increase by approximately .28" (and would be pretty much the same width as a 4.5" diagonal screen with 16:9 aspect ratio, like the LG Spectrum) and length would increase by approximately .42". Because of the aspect ratio of 3:2, a 4 inch diagonal would give plenty of surface area for web browsing etc. Okay, Apple, make it so!! O no that is ugly.... IP4 looks much better?! i dont think the rendering does the concept much justice. the article and mock up are just for screen size. im sure apple would make it much more visually appealing. No, Apple has kept the 4:3 ratio to keep it unified. If they change it to the 16:9, then it would drive the developers crazy because most of the apps won't work as well anymore. The iPhone has a 3:2 aspect ratio not 4:3 like on the iPad. that might be possible with Apple.They already taught us how to hold a phone,why not this. Speaking strictly about screens, not OS, a 16X9 aspect ratio is better for just about everything i can think of. In this case, you're not losing any width of the screen so texting in portrait won't be any harder, you'll be able to view more web page data, watching videos in landscape is better (most movies are 16x9). I really can't think of a way that 4:3 is superior. Devs best not complain, it's not their say. Porting games/apps from other systems would be easier. Also, Scott H, your screen dimensions are off. You kept the 960 instead of the 640. The screen would be closer to 1152X640, which really, if I was "Apple", I'd probably just kick it to 1280X720. 720p resolution sounds a lot better than 1152x640... edit= can anyone think of a reason why 4:3 aspect ratio is better than 16x9 on a phone? The iPhone screen is actually 3:2 aspect ratio which is in between 3:5, 3:5.33 (16:9) and 3:4. If they kept the same aspect ratio but mad either phone screen size larger like up to four inches, then it would be a great device for text messaging in portrait mode. Seriously, the iPhone's screen is alright for messaging as of now (I have large thumbs but they are quite nimble) but watching video is a pain in my iris....Just saying. A 4" screen would be nice, but I do just fine with my iPhone 4 screen. A smaller screen also means better battery life. I agree I like my iPhone 4 the way it is. I don't think Apple will change strategies because they are selling very well up to now and only a rating-popularity drop would make an effect on the hardware team leading to improvisations. This is Apple. They have their own way of doing things. I think they like to play it safe and they never seem to take a big jump. If they dont bump it up to a 4.0 inch than it will lose the costumers fast and will want to use another phone.Better phones are coming out in the coming months with better specs and screens like the Samsung Galaxy S 3 , if they dont do something than it wil be overshadowed and it will be a 2nd rated phone regarless what they call it on the final product. Its already a 2nd rated company already since last year. You cant teach a old dog new tricks what what Apple seems to be doing. I just dont see Apple a big competitor anymore since last year. They never seem to take a leap of faith. Look at the ipad 2 to the ipad 3. not a big jump. Apple gives people what they want and the sales of the iPhones to date have supported this. Not only are the consumers happy, the Apple developers are happy as well. It's funny how the critics never look at the hard data like number of units sold, customer satisfactory scores, and instead make up opinions that only make sense to themselves. It's a phone and battery life is important. Plus it now has Siri in beta. I had a 4s, it wouldn't last 12 hours just sitting there, and that was iOS 5.1. I got a RAZR, it lasts 2-3 DAYS, and has a 4.3 inch LED screen. I'm sorry but the 4s is horrid in the battery department. Which is wierd because the iPhone 4 was pretty good batterywise.